Having a birthday? Enjoy singing along with our 10" Singing Happy Birthday Cupcake Bear. Give him a squeeze and his head sways, mouth moves and candle lights up while singing "Birthday Polka." Fun for all ages. Bear comes in assorted colors (our choice please). Birthday bear requires 2 AA batteries included. 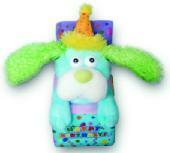 Celebrate that next birthday along with our happy plush pooch. He sits inside his colorful birthday box. Give him a press and watch his head bob and ears flap in synchronization to the tune "They Say It's Your Birthday." Bring him out for all those special birthday festivities. Birthday dog measures 12" tall and requires 3 AA batteries included. Complete your birthday festivities with our adorable 22" chenille singing birthday bear with a cake on the top of her head. Just squeeze her hand and the candles twinkle, her head sways and mouth moves while singing "Happy Birthday to You." Bear requires 3 AA batteries included.